(1) Go to Bucks or a coffee shop you can park very close to – don’t do this at home. Use earplugs if the noise bothers you, but being at a public place is important to avoid isolating. (2) Leave phone, computer, iPad, etc in the car. (3) Bring a watch to time yourself. (2) A couple pens and highlighters. (3) Hope for Today or Courage to Change (Al-Anon). (4) The Language of Letting Go (Melody Beattie). 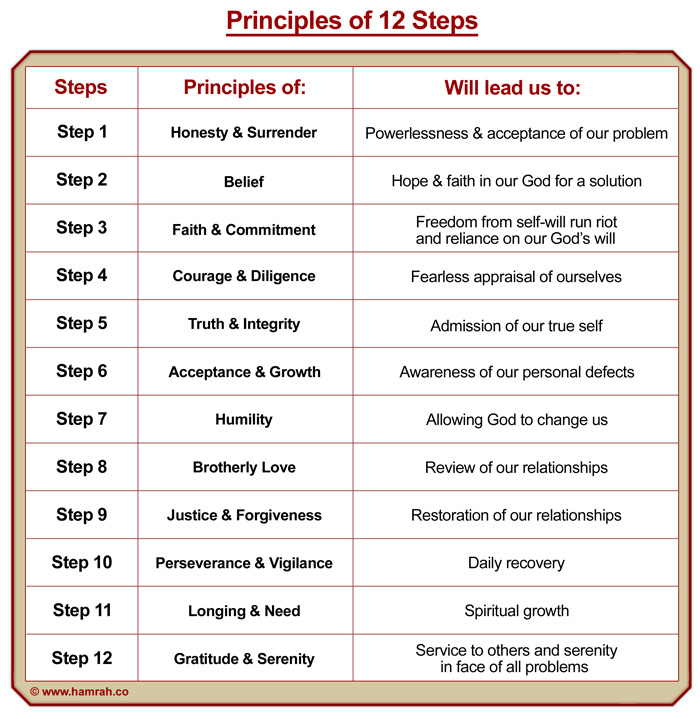 5 min: STEPS – Read the step of the month and the principle (see bottom of this list). Step 1 in Jan, 2 in Feb, etc. 5 min: MEDITATE – With eyes closed, think about the step and principle and how to apply it today (See bottom of this text). 5 min: Journal – Write date, time, place, and a brief summary of what’s been happening since yesterday. Make note of any good stuff and things you can improve. If you owe an amends write it and then immediately call and make it or text. Don’t use the word “sorry”. 5 min: Read – Courage to Change. Highlight what’s good. 5 min: Read – Hope for today. Highlight what’s good. 5 min: Read – Until Today. Highlight what’s good. 5 min: Get phone from car. 15 min: Write – as a text message one highlighted sentence from one of the 3 books you read, followed by 2 sentences (max 30 words) of experience strength and hope related directly to that text. See 12stepwork.com. Now go start your day knowing that you’re not a half-measures person and you put your program 1st! * Note: Using the regular group texting on cell phones creates a problem, in that, when someone responds to you, they end up responding to everyone else in the group, which is annoying. I suggest an app called Group Text! By Andrea Vettori. You’ll avoid that problem. It’s easy to add/subtract too.